Misfit wearables, makers of the Shine activity monitor, announced on Thursday a partnership with Beddit, an ultra-sensitive sleep tracking system that slips under a user's sheets to measure everything from respiration to movement. Billed as one of the least intrusive sleep sensors available, the Misfit Beddit Sleep System is a "paper-thin" device that can be placed on a bed's mattress just below the sheets to measure a wide spectrum of sleep metrics. As the user is sleeping on Beddit, it measures sleep cycles by using physiological data like respiration, heart rate, movement, snoring and ambient sound. The raw information is automatically transmitted to Misfit's app for processing and storage, granting quick access to sleep habits, statistics and visualizations can be accessed. One of the advantages of having a semi-permanently installed tracking system is that users don't have to wear wristbands or other paraphernalia that can inhibit a sound night's sleep. Additionally, with sensitive sensors and specialized algorithms, Beddit can generate information on a per-user basis even if two people are sleeping in the same bed. Each person needs their own device for accurate readings. While Misfit's own Shine wearable device tracks sleep habits, it still needs to be worn on the wrist to work. "Shine delivered on the important function of activity tracking, but we saw that sleep tracking was one of the most engaging features because Shine does it automatically, unlike other activity monitors," said Misfit CEO Sonny Vu. 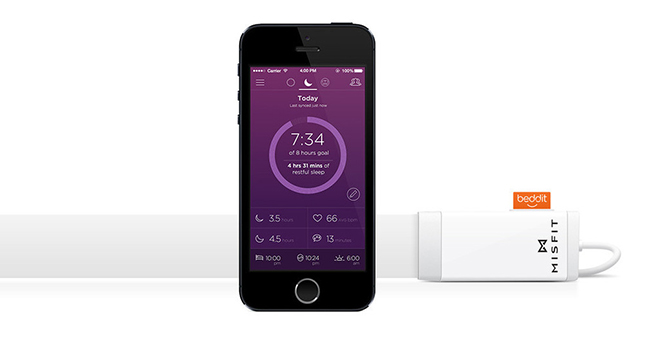 "With Beddit, we're making our sleep tracking functionality even more robust. Not only are we able to measure more, but even less is required of the user - a frictionless experience." The Beddit Sleep Monitor can be purchased from Misfit's online store for $149.99, while the Misfit app is a free download from the iOS App Store.